Subseries contains 55 volumes of the Alumni News, covering the period 1920 to 1984. File contains articles regarding Kerslake, including her writing and general career. Several include pictures. Not all are identified, but newspapers include The Times (Saint Mary's University) and The Bridgewater Bulletin. File contains a newspaper review titled "Blind Date : A collection of finely honed short stories" by Lorna Inness. 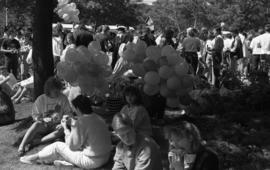 It is from the Reader's Corner section of the Chronicle Herald/Mail Star, Saturday, September 23, 1989, page E4. File includes clippings of Joyce Barkhouse's "For Mothers and Others" column, which appeared in newspapers in the 1970s. The column discusses Barkhouse's personal experiences. 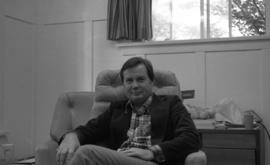 Series contains materials depicting Brian Hall in the media. Written materials include newspaper articles, certifications, and correspondence. Related materials include photographs. 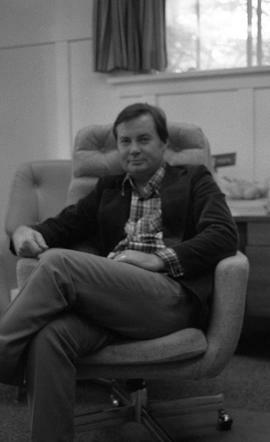 File contains documents and photographs depicting Brian Hall in the media from 1978 to 1999. Materials include invitations, correspondence, and newspaper articles. 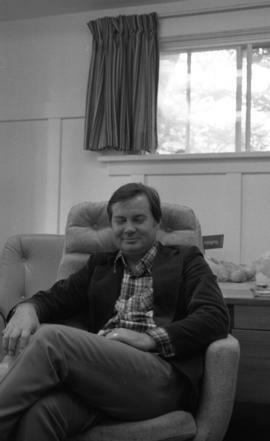 File contains documents and photographs depicting Brian Hall in the media in 2005, including his Killam Prize win. Materials include magazines and booklets, correspondence, and newspaper articles. Item consists of correspondence from Dorothy Dobbie of BGN publications to Mr. Alvin Savage of the Halifax Herald, regarding an article to be published in the first edition of the Federal Government Dockyards trades and Labour Council Annual. File contains copies of newspaper clippings that John Daniel Logan collected, including those that mention him or his work, and an advertisement for his book "Highways of Canadian Literature" that he wrote with Donald G. French. These materials were originally filed with the programs located in (Box 4, Folder 14). File also includes a sheet of caricatures drawn by Wilhelm Busch. 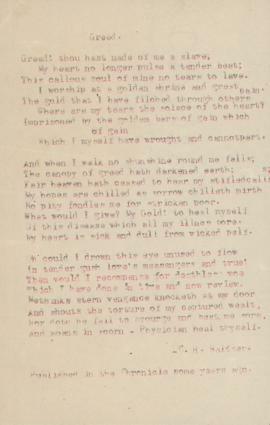 File includes a copy of a newspaper clipping of "Hymn to Liberty" a song with words and music by Arthur Farwell, published in the New York Times. File contains copies of newspaper clippings that John Daniel Logan collected, mostly of concert reviews, including concerts that he attended. Many of the clippings do not include the date or name of the newspaper that he retrieved the review from. File also includes clippings about Ellen Ballon's collection of miniatures from the Good Housekeeping magazine. 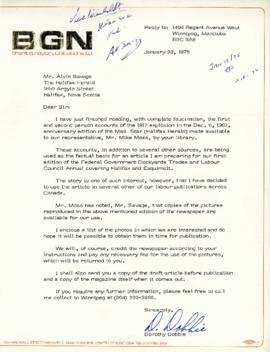 File contains copies of newspaper clippings that John Daniel Logan collected concerning the late John J. Stewart, editor of the Halifax Herald. 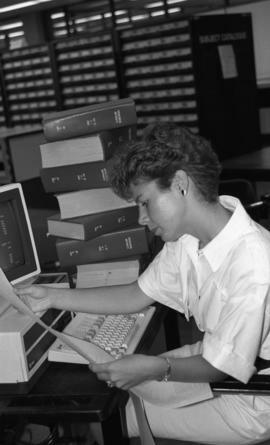 Item is a photograph of Sharon Doucette at the Killam Library's Information Services using a computer to search for information.Pelham and Watson photos. 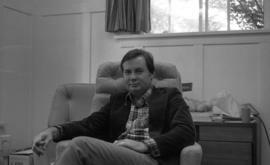 Item is a photograph of Alan Kennedy, Dalhousie University Department of English. 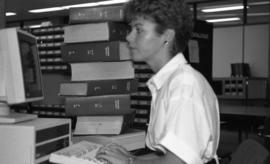 Item is a photograph of Sharon Doucette at the Killam Library's Information Services using a computer to search for information. 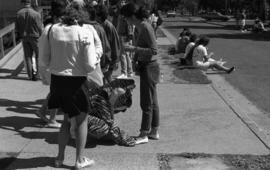 This photograph appeared in Dal News, September 21, 1988. Pelham and Watson photos. 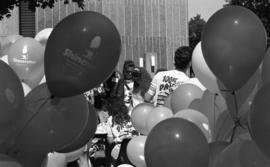 Item is a photograph of unknown students participating in Shinerama at Orientation. Pelham and Watson photos.